Federal law requires all states to assess students in grades 3-8 in math and reading. We begin our calculation with the percentage of students who earn scores that qualify as proficient on these state math and reading exams. We average the proficiency rates in these two subjects to get the school's overall state proficiency percentage. Because each state creates its own proficiency standards, the standards vary substantially, making direct comparisons between schools in different states impossible. It is also often easier to earn a proficient score on a state exam than on the leading national exam (i.e., NAEP). 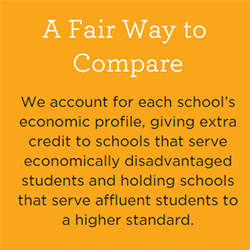 To apply a common, rigorous national standard to all schools, we use a simple statistical method to determine the percentage of students who would qualify as "proficient" under the federal government's National Assessment of Educational Progress. 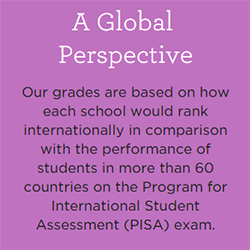 This allows us to compare how each school's students perform relative to their peers across the country.